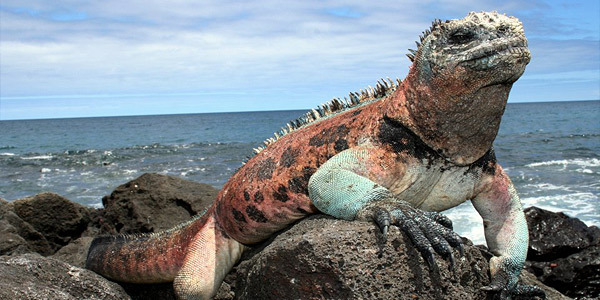 True Ecuador Travel's Island-Hopping Tours of the Galapagos Islands offer the most economical way to explore the wonders of the Galapagos Archipelago - staying in tourist-class hotels and enjoying half-day and whole-day excursions that take you to several different islands with experienced guides on comfortable and fast yachts and catamarans. Our hotel-based programs offer several distinct advantages to visitors. While many are happy to spend up to a week living on the cruise boats, others prefer to take advantage of the opportunities offered by returning to shore each day after your activities. Our programs are from 5 to 10 days, with options to visit many different islands. We give you access to our unique app that offers information about the history and environment, weather, a secure document repository, and ideas for free and low-cost activities to do. These programs are ideal for families, especially with younger children. You get to sleep in a bed that is not moving! For many people being below deck with a slight constant motion is unsettling and makes sleeping well more difficult, if not leading to sea-sickness or dizziness. Our island-hopping programs are especially suited to children as they have much more room and freedom. After your daily excursion you can shower and wander around the delightful small towns of the Galapagos, eat what and where you choose, enjoy a coffee, beer or ice-cream as you watch the ocean from the shore or check your email from your hotel or a local internet café. There is greater freedom and flexibility with the island-hopping tours, so you can include or exclude activities that might not suit you. We prefer to promote the island-hopping tours because they tend to put money a bit more directly into the local economy. By using local transport and staying in local hotels and eating in local restaurants, the economy of the Galapagos islanders is supported. With the island-hopping tours you get the chance to meet locals and understand more about the social life of the Galapagos and the struggle to combine human activity with conservation in such a unique environment. Some of the activities featured on the boat cruises are actually free activities on land, such as visiting the Charles Darwin Research Station, San Cristóbal Interpretation Center or Tortuga Bay. For prices for couples, families and our regular seasonal discounts please contact us. The island-hopping tours use high-speed launches and motor yachts for the daily whole-day or half-day excursions and to ferry you from one island to another. Accommodation is in local tourist-class hotels (upgrades are available). 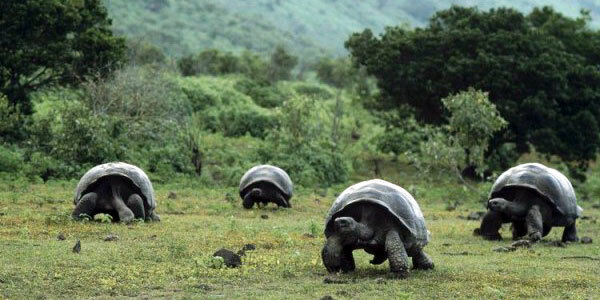 You will be met at the airport in the Galapagos and escorted to your hotel. The agency will run over the week's activities and answer any questions that you may have. Excursions are reserved for you with various local boats, so that you will be with a different crowd of people each day - generally up to 16 people maximum. 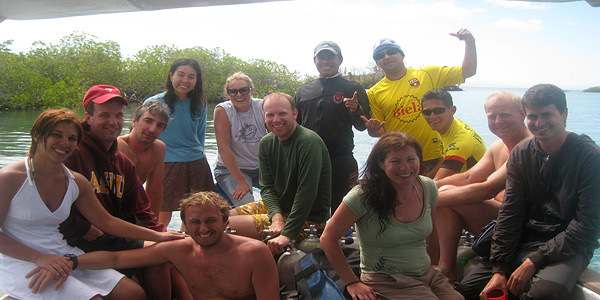 The guides are all excellent, qualified and experienced Galapagos guides who speak good English and can give you a complete explanation of everything. 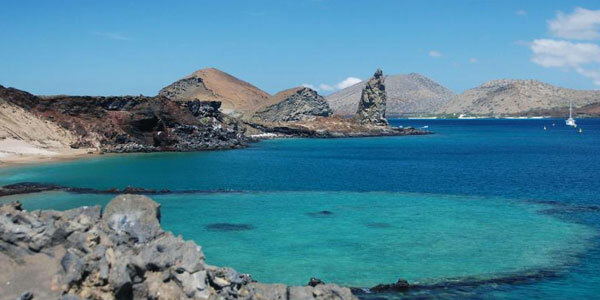 See the list on the right hand side of this page for the Galapagos Island-Hopping Tours that we offer. "I am not a boat person, so I really appreciated being able to spend the majority of my time on shore with all the freedom that gave me. The boat excursions were great, but much better to get back to dry land at the end of the day and be in a hotel with internet and freedom to walk around town." The table below shows average prices for different categories of cruises compared to our Island-Hopping programs.